$49.99 with Free shipping in the U.S. 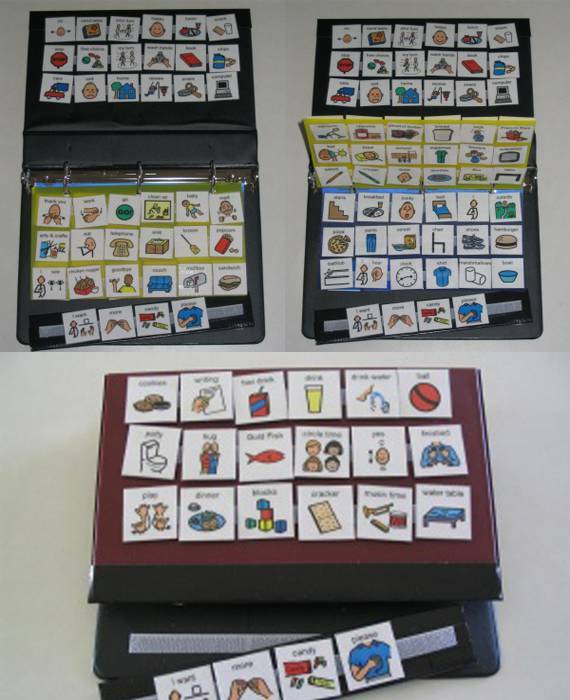 This custom designed Communication Book has 96 Free Communication Pictures. Each Picture measures 1.25 inches square (perfect for little hands) and is laminated with durable 5ml plastic. Yes, the Velcro is attached to every picture. The book has a removable sentence strip and is ready to use from the second it arrives. It was developed for use at School and in the Home. Its compact size makes it convenient to travel around in your child’s backpack. The binder measures 9 inches on the spine and 7 inches across the back and around 5.5 inches across the cover. (to accommodate for the sentence strip) The book has two very sturdy poly inserts which contain Extra Space to Personalize your very own Schedule. I, I want, more, finished, please, thank you, circle time, yes, no, play, work, stop, go, cracker, snack (2), chips, drink, box drink, drink water, ball, blocks, baby, hug, gold fish, cookies, writing, music time, potty, dinner, lunch, breakfast, arts & crafts, happy, sad, home, recess, cars, free choice, computer, your turn, my turn, wash hands, sand table, water table, clean up, mad, eat, broom, vacuum, telephone, sink, stairs, couch, mailbox, goodbye, chicken nuggets, sandwich, I see, I hear, popcorn, cheetos, peanut butter, bread, sick, French fries, hot, yucky, tired, school, pajamas, flowers, television, pencil, crayon, quiet, noodles, bus, table, bed, outside, pizza, pants, cereal, chair, shoes, hamburger, bathtub, clock, shirt, marshmallows, bowl, diaper, candy, hot dog, and book.